Jason Ma 馬良傑 is Founder, CEO, and Chief Mentor of ThreeEQ Inc., a premier global education and business consultancy forged and based in Silicon Valley, the innovative and supercharged epicenter of overachievers. Ma’s core mission is to mentor and create next-generation leaders. For select families, Ma serves as a foremost elite college admissions, career, and life coach and mentor for high-achieving Gen Zers, while being a trusted advisor for their parents. In addition, Ma helps select enterprises win by serving as a high-powered CEO/C-suite advisor, global rainmaker, keynote speaker, and/or masterclass leader. Ma is the critically acclaimed author of Young Leaders 3.0, former Forbes contributor on Mentoring Young Leaders with over 1 million views, Forbes Global CEO Conference delegate for 8 years, and leading member of the B20, the business/private sector’s voice of the G20, serving on the B20 Employment and Education Task Force from 2014 to present. Ma’s perspective is enhanced with over 3 decades of seasoned experience and impact in operating and advisory roles in innovative technology, education, and expert industries—and with over 2 million miles of world travels logged to over 40 countries across Asia Pacific (Greater China, Southeast Asia, South Asia, Japan, Korea, and Australasia), Europe/Israel, and the Americas. As a tech senior executive and entrepreneur earlier in his career, Ma successfully made deals with and sold big-ticket communications and networking systems and services to major mobile/telecom operators, Internet service providers, and enterprises primarily across Asia Pacific. He co-built leading tech companies and teams (subsequent IPO or M&A), and co-founded, invested in, and exited astutely from a few U.S. and Asian tech/media/telecom, edtech, and private college counseling/education services companies. These days, besides advising CEOs/C-suite executives, global rainmaking for business clients, and speaking on the world stage, Ma finds his own personal fulfillment by mentoring and guiding private family and individual clients to achieve great outcomes (college admissions, careers, and other key milestones) in their life stages (from teens to boomers) with strong and sustainable “3EQ” and happiness. Today, with a tight-knit A-team at ThreeEQ, Jason Ma inspires and guides select high-achieving Gen Zers to get admitted to elite best-fit colleges and universities, to pave lucrative tech and other career paths, and/or to handle succession planning and integration as next-generation leaders. Their parents look to Ma as a trusted chief mentor and confidant in guiding their children to achieve great outcomes, while transforming upward and unleashing their full potential—so that their happiness, health, and wealth will be above the fold in our fast-changing, turbulent world. Success stories and testimonials abound. 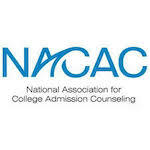 On elite college admissions results, Ma has a distinctive track record of helping nearly 100% of his high-achieving teen students authentically get admitted to all Ivy League schools (Brown, Columbia, Cornell, Dartmouth, Harvard, Penn/Wharton, Princeton, and Yale), Stanford, MIT, Georgetown, UC Berkeley, Oxford, and ALL other elite institutions. As a trusted CEO/Board advisor and high-level global rainmaker, Jason Ma leverages and applies (1) his high-powered global network of billionaires/tycoons, CEOs, and other decision makers and (2) his incisive G20 and B20 worldview, business acumen, mentorship capabilities, and high-level relationship-building and dealmaking skills. Ma helps select global tech and offline growth companies and family offices/businesses worldwide take successes to next levels. Globally, Ma helps them win major clients and deals, position for M&A, and/or enhance profitable revenue growth. Internally, Ma helps them make sound strategic decisions, strengthen next-generation leadership and human capital, raise team productivity, and increase ROI. In addition, as a pragmatic and compassionate executive coach, Ma privately advises and coaches select middle-aged and millennial senior executives and entrepreneurs to enhance their well-being, performance, and fulfillment at work, in community, and at home. Ma is a leading member of The B20, the business/private sector’s voice of The G20, serving on the B20 Employment and Education Task Force from 2014 to present. The G20 represents 85% of the global nominal GDP of more than US$80 trillion and 66% of 7.4 billion people. On behalf of the entire G20 business community, the B20 leads engagement with and recommends policies to the G20 Leaders (heads of state) and their governments. Ma has contributed through the G20/B20 presidencies of Australia, Turkey, China, Germany, and Argentina. With an incisive global perspective, Ma pays particular attention to the future of work, talent, and education, the impact of AI and technologies, and digital transformation. Furthermore, Ma is a World Chinese Economic Forum Global Advisory Council member, DC Finance Family Office Conferences Steering Committee member, and NYTimes Higher Ed Leaders Forum delegate. He is a former APEC CEO Summit delegate, Pacific Basin Economic Council member, and Forbes Global CEO Conference delegate for 8 years. As a sought-after speaker and masterclass leader “uncaged” in ballrooms worldwide, Jason Ma inspires, motivates, and galvanizes audiences—from Gen Zers and millennials, to parents, to middle managers, to global CEOs, to family offices, and to tycoons/billionaires—enabling them to reflect and transform positively. In addition to his professional speaking platform, Ma is represented by top speakers bureaus, including the Harry Walker Agency (the #1 speaker agency in the world), London Speaker Bureau, Executive Speakers Bureau, All American Entertainment, MFL Global, and A-Speakers. Around the world, Ma has delivered speaking engagements at major enterprises, global summits/conferences, private (ultra) high-net-worth family groups, educational institutions [Stanford University, UC Berkeley, INSEAD, Los Angeles Unified School District (LAUSD), and top high schools], and the Harvard Business School Association. 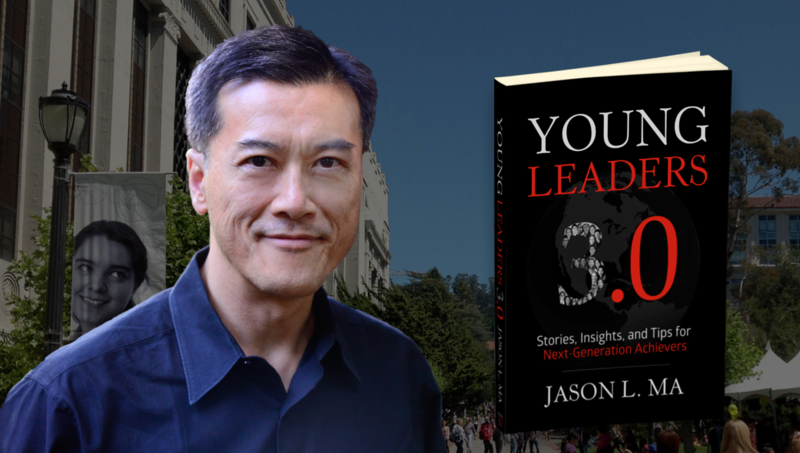 Jason Ma is the acclaimed author of the book Young Leaders 3.0: Stories, Insights, and Tips for Next-Generation Leaders. He is a former Forbes contributor on elite U.S. college prep and admissions, next-generation leadership, entrepreneurship, innovative higher education, and mentorship with over 1 million views. Ma’s work has been featured in various top media, including CNBC Asia (Managing Asia and Squawk Box), Business Rockstars, Fast Company, Channel NewsAsia, and others. Ma is one of “The World’s Top Experts” and an investor at Audvisor (fellow Experts include Tom Peters, Mark Thompson, Seth Godin, Heidi Roizen, Vinod Khosla, Guy Kawasaki), a leading corporate communication and learning app. Ma is also a Luminary for IfOnly, which provides clients with unique experiences with luminaries, including Snoop Dogg and Hall of Fame 49er Ronnie Lott. Originally from Hong Kong, Jason Ma is multicultural, fluent in Cantonese, and speaks Mandarin. He and his wife are joyful parents of two happy, high-achieving Gen Z daughters (ages 21 and 18). In the Ma family (playfully, the “MAfia”), Ma values unconditional love, humor, and high standards on what matters. Ma earned a Bachelor of Science in Industrial Engineering and Operations Research at UC Berkeley College of Engineering. He also attended the evening MBA program at Santa Clara University Leavey Graduate School of Business for a few years but dropped out because of extensive international business travels. Through the decades, Ma has also invested multi-6 figures in learning from other top experts of experts and integrated key learning into his own foremost mentoring framework and process. Ma believes in giving. The ThreeEQ Foundation, a small donor-advised fund, works with the Silicon Valley Community Foundation to give to causes that assist the disadvantaged. ThreeEQ also donates some pro bono services to charity. The passionate ThreeEQ Team rejoices when our Clients win, grow, and succeed like never before! Our highly trained and seasoned teammates in Editing, Advisory/Mentoring, Business Development, Online Solutions, Finance, and Administration share our Founder, CEO, and Chief Mentor Jason Ma’s vision, values and principles, and high standards on what matters. Blessed with unique, best-in-class proprietary know-how, methodologies, and processes, we pride ourselves in providing the highest-quality work for our Clients. Founder and CEO, Magnet Systems, Inc.
To learn about Mr. Minevich, please view his website above. Another of Jason Ma’s project team comprised 30 people, including 23 exemplary 17-to-24-year-old Gen Z and Millennial leaders and contributors, and support cast. 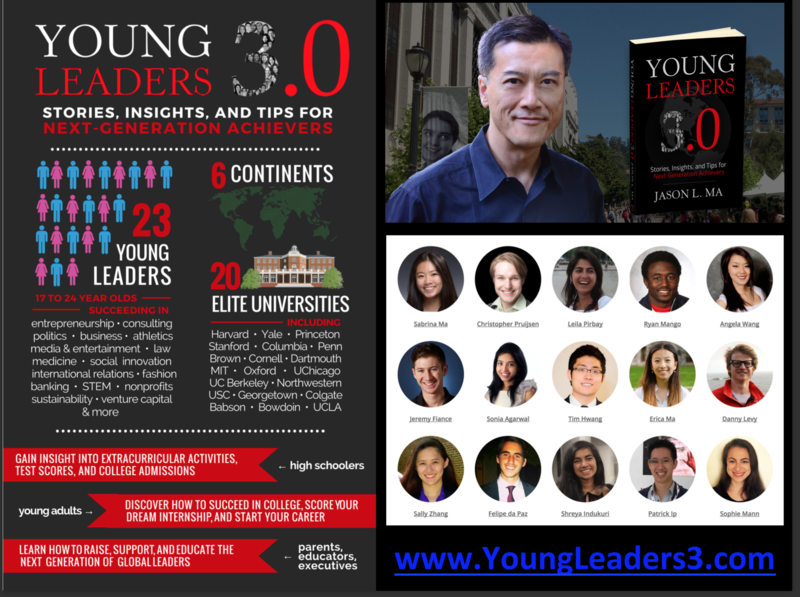 We are grateful for their help in the creation and production of Young Leaders 3.0: Stories, Insights, and Tips for Next-Generation Achievers, an inspiring and acclaimed book published in December 2014. Having earned the privilege to attend or speak at some of the world’s most influential business gatherings, Jason L. Ma has met some of the world leaders, private sector tycoons, global 1000 CEOs, and fellow business and education influencers. As mementos of these great meetings, Ma has garnered many photos with these renowned achievers.